(Recommended) Design beautiful landing pages with leadpages. Create a new document (Ctrl + N) with the dimensions 1200 x 1245 with a white #ffffff background. Right-click the background layer and select “Layer From Background” from the the menu, give the background layer a name then add a “Gradient Overlay” using the settings below. Select the “Elliptical Marquee Tool” (M) then drag out a big ellipse onto the top of the canvas. Create a new layer above the background layer then label it “Background Jazz”. Now select the “Gradient Tool” with the following options. Drag the gradient over part of the top of the ellipse, we don’t want to fill the whole ellipse. Deselect the ellipse (Ctrl + D) and you should have something like this. Duplicate, rotate and adjust the opacity of each layer randomly placing them in the top half of the canvas. I’ve simply done this 3 times. On the left side of the canvas add the portfolio title and slogan using the “Type Tool” (T). The font is used is called “Vijaya” and can be downloaded from the resource list. Select the main title layer then add the following layer styles. On the right side of the title and slogan add a simple textual navigation using the same font. For the hover effect on one of the links simply turn the text black and add a underscore. Select the “Rounded Rectangle Tool” (U) with a radius of 10px then drag out a decent sized rectangle underneath the header elements. Now select the “Rounded Rectangle Layer” and label “Featured” then add the following layer styles. Now set the layers opacity to 50%, you should have something like this. We now need to add our featured image inside of the rectangle, the image should be around with 15px smaller all the way around the rectangle. To do this first load a selection around the featured rectangle. To load a selection click the little thumbnail in the layers window on the desired layer whilst holding down the CTRL key on the keyboard. Once the selection has been loaded go to “Select > Modify > Contract”. Contract the selection by 15px then press OK. With the selection still loaded download and open the featured image. Copy the featured image to the clipboard then head back to your original canvas and go to “Edit > Paste Special > Paste into” (Alt + Shift + Ctrl + V”. Maneuver and resize the image so it looks how you want it to. Finally deselect the selection with “Ctrl + D”. Select the “Pen Tool” (P) or the “Polygonal Lasso Tool” (L) and make a selection over the featured image like the image below. Fill (G) the selection on a new layer with the color white #ffffff, then set the layer opacity to around 35%. Next, we need to add the featured image caption. Simply select the “Rectangular Marquee Tool” (M) then drag out a rectangular selection across the bottom of the image. Fill (G) the selection with any color then add the following layer styles. Select the “Type Tool” (T) then add some caption text inside the rectangle, you should have something like this. Select the “Rounded Rectangle Tool” (U) then drag out a small square underneath the featured area. Change the squares color to white #ffffff then contract the square by 5-10px just like we did to our featured image. Once contracted paste inside one of your portfolio images. Repeat this step 3 more times so you have a total of 4 images. On the left and right sides of the thumbnail images add two arrows from the custom shapes library. Add the following layer styles to the two arrows. Start off by adding a simple divider underneath the featured area. The divider was created simply with the “Type Tool” (T) using the “Dash Key (——)”. Once you’ve created the divider add the following layer styles. Finally set the dividers opacity to 50% and your done. Now, using the “Type Tool” (T) add the portfolio tag line, the font i used is “Vijaya” which you can download from the resource list. Finish off the tag line by duplicating the divider you created earlier then dragging it underneath the tag line. Download the “Woofunction Icon Set” from the resource list then add two icons into the content area. On the side of each icon add a main heading and and sub heading. Underneath each heading and sub heading at a decent sized paragraph, separate each section with the divider we created earlier only this make it vertically. In the space left on the right side of the content area add a little blog feed. Finally duplicate the long horizontal divider and drag it underneath the content we just created. Select the “Rounded Rectangle Tool” (U) then drag out a rectangle underneath the last divider you just created. Now add the following layer styles to the twitter rectangle. Inside the rectangle add a little twitter bird of your choice then add the twitter text in which you normally see on a tweet. Duplicate the 3 “Background Jazz Layers” then drag them to the bottom into the footer area. Finally inside the footer add your copyright text and maybe some social icons from the “Woofunction Icon Set”. Typical “Richard” style, back to work uh, great tutorial after a long time since hvdesigns :), thanks for sharing…. Once again a clean and nice tutorial! going to try it as soon as im @home! @Rajasegar: Don;t no know wether thats was a positive or negative comment. Can you describe “Typical Richard Style”? Could you eventually do a converting a Photoshop layout into HTML and CSS. And also a tutorial on Typography. It would be muchly appreciated! I am pondering the thought of doing a PSD Conversion. I used to read Chris Spooner blog, but it seems that there’s many others who creates these great tutorials, like you. I’m first time here, and your blog seems to be the great source for graphic designers. Thanks so much “Haris Tahic” its comments like yours which keeps me going. @RAJASEGAR: many thanks for clearing that up. glad i inspire you. I’m sure i will be creating awsome tutorials for years to come. Just a note to all of you, the PSD to HTML tutorial looks like it will get written but a fellow designer of mine might be writing it. I will definetly post it up as soon as its done. Wonderful Layout ..! It’s hard for me i m just learning new things in photoshop thanks for this post ..! awesome work…it really inspired me….guess u got new follower n i got new awesome teacher…..
Wow! Great tutorial, I like the layout. Great, just great. Tutorials like this proves that you can get great information for free, still! Most of the Photoshop sites i visit charge for such tutorials. Thanks for explaining everything in details and providing all this info for free! great design. but i still have a hard time making it to htms or css for website. Great tutorial Richard.. Love it.. Awesome tutorial. Following it now and hope to use my version for my portfolio site. Thanks a lot! I was just saying to one of my friends, I want to create, a digital portfolio. Then I came accross your site on twitter. Wow, just the kind of layout I want. Have a look at my blog, I am new to website designing and having little time, I created a blog, just for now tho. Thanks you so much for this tutotial. some queries clear with this nice tut. This tutorial was just amazing! Thank you so much for sharing. You are very talented. Great work! Also looking forward to the PSD to HTML tutorial. great !Could you be my master? Im a programmer.I am now studying PS.I take some projects and need a designer. I appreciate the effort that went into this tutorial :) I’ve made my design a little bit different here and there but it only added to how much i’ve learnt. I did have some issues on the Mac with the ‘Paste into’ command. When i copied the file from Finder and tried to paste it, it gave me a default image of a jpg. To fix this i had to open the image in Photoshop and use the marquee tool to select the entire image and then copy it. If anyone knows what caused this problem, i’d be pleased to learn it. Thanks. Awesome tutorial thanks. I have just started designing, it helped a lot. I ran this whole tutorial through a trial version of PS on a mac. It was a great way to dive and learn how to use photoshop. there were some minor differences but nothing difficult to figure out. Thanks. Thanx u very much for the tutorial..
Tutorial looks great, I’m completely new to Photoshop and I’m lost on one section, at the beginning.. If anyone can help, it’s really appreciated. I’m having difficulty with the Gradient Tool. I’ve followed the steps until the ‘Background Jazz’ layer. I can’t get the gradient to fill only the top of the eclipse and not the entire thing. When I drag the gradient it automatically fills the entire selection. I don’t know where I’m going wrong? Great design. Need some tutorial for wordpress conversion for this web layout. really very good benefit tutorial ,, I’m newer in the web design field ,, it helped me very much ,,, thanks again ,,, i have a question for you if you please to me..! how can i remember all these steps in Tut if i wanted to design mine? and how can i be creative to design like you? well well .. this web layout is easy to understand .. it’s good not like as typical . 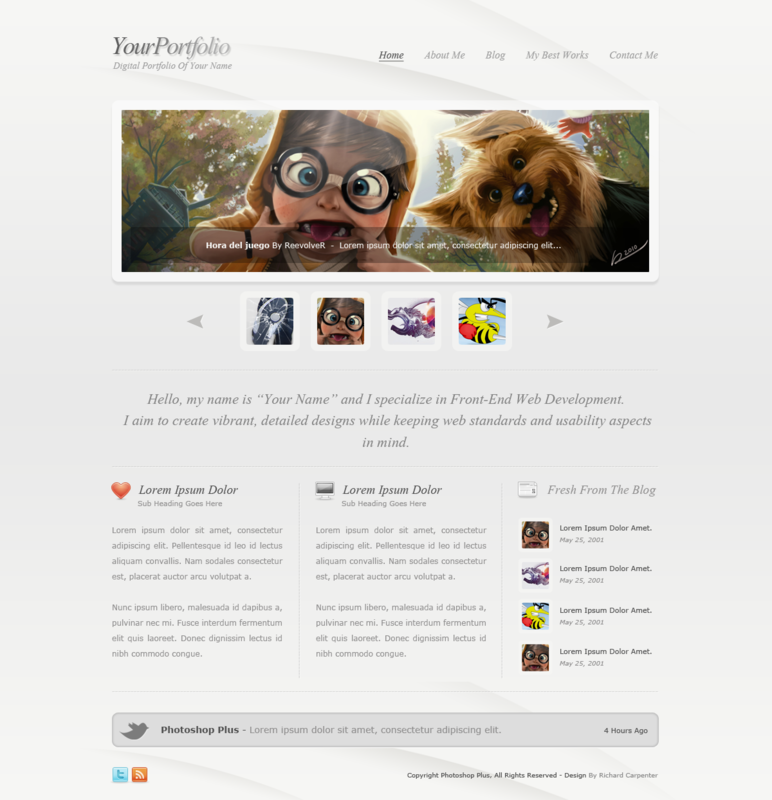 It is really a beautiful and creative portfolio having some vital information over the subject. Thank you for share. Hi Komal, Thanks for your feedback. We will continue to post interesting and unique tutorials in future also. Will look forward for hearing from you again. Thanks so much for sharing the info. This tutorial has been really helpful to me!